Because I thought I lived in Texas. Where it is supposed to be warm and sunny. I think someone may haved missed the memo on this, because this winter has been crazy! Yes we have had a few days of 70 degree weather, but it has been interspersed with ice days/blizzards and now... today... more snow than I have ever seen fall in Texas. It snowed all day, from around 8:30am on. And it is still snowing. 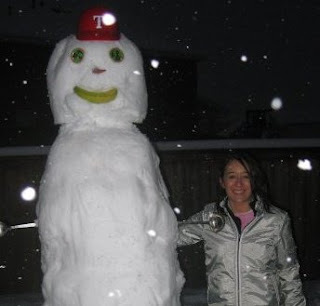 Then, after David left & Alan came home, we made a MASSIVE snowman in the backyard. Alan named him Epic Man. Epic Man is a full head taller than Alan, and wayy taller than me. All in all in was a good day. I am just so thankful I was not scheduled to work today... and especailly thankful I am not working tomorrow because it is supposed to freeze tonight. If you are driving tomorrow, please be careful!